Trying out posting from the WordPress app for iOS on my new iPhone 4S. I’ve waited a long time for this–patiently waiting for T-Mobile to either finish getting swallowed by AT&T or actually get the blessing from Apple to be able to sell the iPhone–but to no avail. So at midnight on the date for pre-orders, along with several million other people, I did my part to help bring Apple’s and AT&T’s servers to their knees. After trying to order through the Apple Store with multiple failed attempts, I finally went to AT&T’s site and had a tough time there as well until about the third time it finally allowed me to complete the order and violá, I was on the fortunate waiting list for the first batch of iPhone 4Ss. Evidently not as fortunate as some in Germany, but hey, at least it didn’t come later. So, I’ve been enjoying the transition from the old-school RAZR (don’t laugh–you know they still look cool) that I’ve had since forever, to the new paradigm of actually having a truly smart phone. 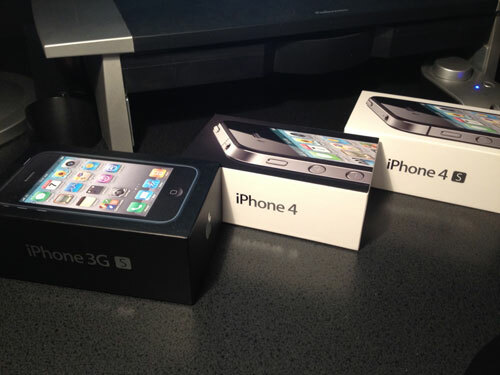 But just to catch up on what I’ve missed out on over the past two or three years, I also ordered a 4 and a 3GS for the rest of the family and can now have a pretty full spectrum of experience with the iPhones that have really mattered. One thing I can say is that I probably won’t make a regular practice of posting from my iPhone, but I’m glad that I can and have enjoyed the opportunity to try it out. However, it’s main drawback with the small screen real estate and lack of a real keyboard for speedier typing, make it harder to put a well-written post. Of course I have other impediments to being able to write a well-written post, but I’ll be glad to use this as my main excuse for this post. Until next time..
I’m having to temporarily change the theme of my blog because my last theme was doing some funky wrapping in Firefox and IE when you have custom Widgets applied. Even with the latest fix, I was still having the wrapping issues. So, for now, I’m using Brian Gardner’s very practical Revolution Code Blue 3.0 theme while I work on a new customized theme. I love what Brian and Jason Schuller are doing with Revolution2 and will give them some free press for little while. I’m also working on a new blog for Whitestone Design Werks that I hope to have up before the year is out as well. So, needless to say, I will be immersed. The new design for WDWerks.com is now live. It actually went live on Tuesday (as I posted last week, I was aiming for Monday), but I was still working on the portfolio pages and getting the slider jquery code to all work properly and just had a scrollable list as an effective placeholder. I was waiting to make any type of formal announcement until that part was ready. I still have several things to finish on it. In addition to rewriting a lot of the copy (I’m always on the look out for good copywriters! ), I will be implementing more jquery effects on the frontpage main image area. I am also working on new CSS for the form on the Contact Us page and will be applying the design to a WordPress theme and launching a dedicated blog for WDWerks. Currently, the blog link directs to this site but that will change soon. Would enjoy getting anybody’s thoughts or feedback on it. And definitely let me know if you see any problems with it.